It's hard to miss Pacific Northwest Ballet's Andrew Bartee, once you know where to look. He's the thin one, with the long, long arms and the red hair. Even when the 23 year old is spinning his partner with the rest of his fellow corps de ballet members, he's a distinctive presence. But lately, you're just as likely to find Bartee center stage, dancing a solo in Crystal Pite's recent "Emergence", or paired with soloist Jerome Tisserand last spring in Ulysses Dove's stark and moving "Dancing on the Front Porch of Heaven." Andrew Bartee came to ballet later than many of his fellow dancers. He was 10 when he saw a friend dancing in a Christmas pageant. "It really struck me," he remembers. "I started dancing around the hallways." So Bartee's parents enrolled him in a weekly ballet class. At $50 a month, it was expensive, and Bartee says his folks kept asking if he was really serious about dance. By the time Bartee hit 13, his Everett dance teacher told him he should move on. "I think my mom looked in the newspaper and found some ad for PNB," he recalls. 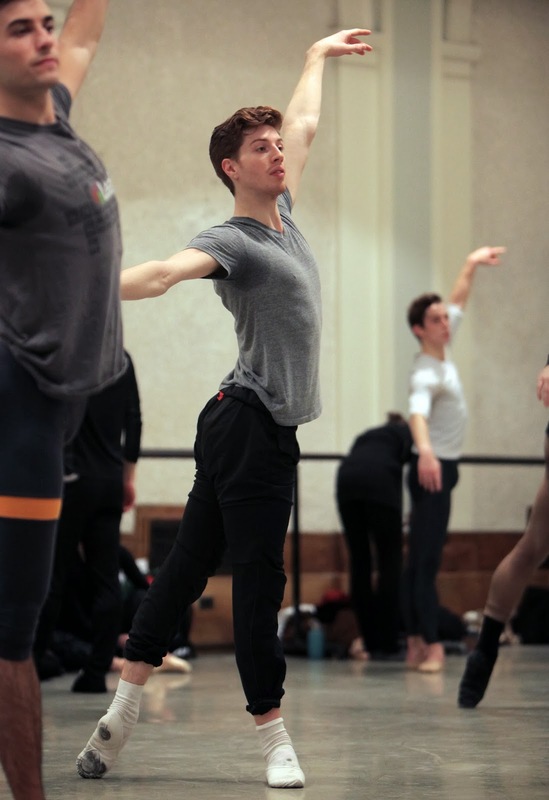 PNB's ballet school was holding auditions, so Andrew Bartee went. He was accepted and offered a scholarship, but Bartee says he had no expectations about making dance a career. Bartee had never even attended a ballet performance. "I wasn't even that serious about it," he says earnestly. "I knew I liked moving, but I didn't have the concept of the life it could be, that I could make it something." Ten years later, Andrew Bartee has indeed made dance "something." As a student, he won the prestigious Princess Grace award. After moving up through the PNB school, Bartee spent a year in the Professional Division before Artistic Director Peter Boal hired him. I first met Bartee when he was still a PD student. He was a shy and deliberate talker, weighing each word before he actually said it. After more than six years with PNB, Andrew Bartee is still soft spoken, but he navigates his world with more self confidence. Bartee is still thin and long-limbed, but his increased technical confidence is obvious, and it really shines in contemporary dances. Bartee's angular limbs distinctively captured the jagged choreography of Ulysses Dove's "Front Porch" and as a swarm member straining to break free in Crystal Pite's "Emergence," Bartee was perfectly cast. Andrew Bartee has pushed himself beyond PNB, though. Since 2010 he's performed regularly with Olivier Wevers' company, Whim W'him. He was a standout this past summer in a solo choreographed by guest artist Anabel Lopez Ochoa. Wevers has created work for Bartee as well, including the well-received pas de deux "Flower Festival", that Bartee performed with Lucien Postelwaite. "I've grown so much from having the experience of having work made on me," Bartee enthuses. That's experience he brings to creating his own dances. Last season, Bartee's "arms that work" was one of four new dances Peter Boal grouped together on a program that was part of PNB's season. The dance featured a large set piece, and a specially commissioned score. "arms that work" was edgy, raw and not quite complete, but it demonstrated Bartee's promise as a dancemaker. That promise has been stoked, in part, by Bartee's budding collaboration with contemporary dancer Kate Wallich. The young artist was trained at Cornish College of the Arts, and her work is most definitely not ballet. "I've appreciated working with Kate over the last year," Bartee says. Wallich has exposed him to dance that is more about ideas than movement. "It was bizarre to me at first, " he laughs. But not so bizarre that he backed away from the artistic partnership. Bartee and Wallich will premier their new dance, "Super Eagle", in February at Velocity Dance Center. 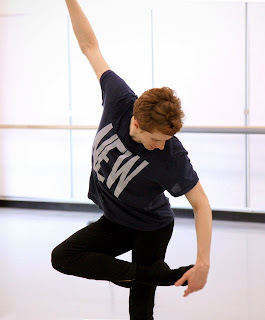 Contemporary dance is clearly where Andrew Bartee's heart lies. He acknowledges that his boss, PNB Artistic Director Peter Boal, has pushed him to strengthen his classical ballet chops. Bartee says the more Boal pushes him, though, the more the young dancer resists. In fact, when you ask Bartee where he sees himself in five years, he'll tell you he wants to dance with a company that specializes in creating new work. "That really excites me," he says, eyes shining. "Yeah, I like being part of something that's moving forward." The thing that angers him most when he thinks about Seattle's dance scene is complacency. When Bartee looks around he doesn't see a lot of dancers who push themselves beyond the limits of the choreography they're performing. "There's so much more space to touch," he explains. Physically and metaphorically. They Make Me Feel Like Dancing!